Known as the ''Sea of Morelos'', Lake Tequesquitengo is a haven surrounded by a large number of hotels, tourist attractions and a residential area. With perfect weather all year round, its warm days allow you to be outdoors without getting sunburned and its moonlit nights let you take splendid strolls along the waterfront. 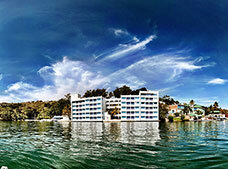 The lake has inspired many legends and its fabulous attractions add elements of magic to the town. For many residents from the central states of Mexico, this lake represents the largest and nearest body of water in the area. It has become in recent years a popular destination for the weekend tourists but it originally attracted tourists for longer vacation stays. The beach clubs, marinas, extraordinary restaurants, bars, spas and recreation areas are the perfect draw and have prompted tourists from all over the world to come and visit. Tequesquitengo is located only half an hour away from Cuernavaca and 15 minutes from the old Hacienda San Jose de Vista Hermosa. The lake produces and stores an important supply of energy for the state and is surrounded by the town of Tequesquitengo. The main source of income comes from tourism and the recreational water and mountain activities. The town's name derives from the word ''tequesquite,'' which means ''blooming salt,'' referring to the growth of salt crystals on the surface of the lake, caused by the evaporation of salt-laden water. It is also used for making soap and as a condiment, among other things. This mineral was very abundant in underground deposits and it was used and traded in pre-Columbian times. When Mexico was still a Spanish colony, the old town of San Juan Tequesquitengo was founded by the Dominican friars who erected a chapel in the middle of a valley with a small lake on the side, called Lake Tequesquitengo. The town flourished around the chapel and the lakefront was filled with the homes of the workers from the haciendas in the area. The lake began to grow, however, due to the irrigation water that was being siphoned off from the hacienda Vista Hermosa, owned by Hernan Cortez. As the lake filled up, the whole town started to sink because of the disintegration of the salt rock layers on the lakebed. This forced residents to seek higher ground, on what is now modern day Tequesquitengo, forever leaving the old town submerged underwater. The lake is a plentiful natural resource which attracts hundreds of avid swimmers, scuba divers and water skiers, making it a major destination for these sports in central Mexico. For the non-experienced, the marinas offer boat excursions, yacht rentals and banana rides. The possibilities for fun in, on and around the lake are neverending. The lake comprises an area of 4.97 sq. miles with a depth of 98.43 ft. An interesting fact is that there is a natural phenomenon that occurs in the water called ''the overturn.'' It happens in colder climate. When the temperature drops in the winter and the water in the lake gets warmer than the air in the atmosphere, the water at the bottom of the lake surfaces, loosing part of its oxygen content, becoming murky. This natural phenomenon allows scientists to study species of fish, protozoa and bacteria from the lakebed. When the winter is over, the water becomes clear again, making it accessible for scuba diving and underwater observation of the structures, such as the chapel of the old sunken town of Tequesquitengo. One of the most fervent traditions in Tequesquitengo is the festivity of the Rising of the Lord of the Lake, a Catholic celebration which reenacts Ascension Thursday. It is held on the first Thursday in May and also commemorates the appearance of Jesus to a local lumberjack. This festivity gets everyone in town involved each year with a picturesque display of lavishly decorated boats of all sizes. This is preceded by a pre-Columbian ritual and several other activities in town, including the seven-day fair in honor of the Lord of the Lake, creating a lot of commercial activity.